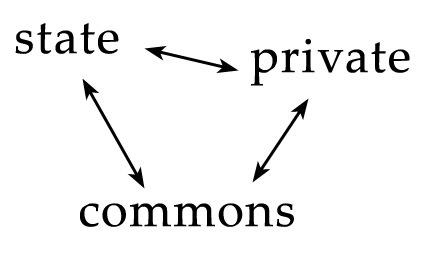 The Commons as the Missing Piece? There’s some really fascinating reading out there about what’s going to happen next. The financial crisis and American imperial overreach has prompted some interesting discussion of the Zakarian post-American world, and whether the US will continue to be the clear hegemon in a multipolar world or just a bruised hegemon that needs to collect itself for a bit after some costly imperial wars within a larger, endless, fruitless global war. Like mortgages and loans, risk has been so divided up and re-distributed that no one was responsible for it all…until now. Americans, so consumption-crazy and divorced from their own government that they seek people outside the beltway and a life free of obligation from serving in the armed forces, have also parceled away their civic duties so much that no one is responsible for the still-to-come falling out in government budgeting and social services, and in consumer credit. Bolder claims by a couple Russian authors discuss whether the US will break into several parts, or whether it’s less prepared for a crisis than the Soviet Union was when it collapsed. At any rate, Francis Fukuyama’s call for an end of history, where democratic capitalism would become the only model, has seemed to fall dully on its face as democracies have struggled and authoritarian governments have consolidated their power while allowing for economic growth, creating a hybrid model that post-Cold War idealists did not anticipate. As Robert Kagan wrote, history has returned and dreams have ended. “The Great Disruption didn’t start in 2008. Over the past decade, technological improvements have made starting and scaling businesses easier than ever. The rise of China, India, Brazil, and Russia mean market leaders have to deal with more sharp-elbowed competitors than ever before. And industries are frantically converging and colliding. “People associate the information age with the advent of the Internet, in the 1990s but the shift from the industrial era started more than a generation earlier, with the deindustrialization of the Rust Belt in the United States and comparable movements away from manufacturing in other industrialized countries. Perhaps Obama’s campaign and the grassroots/netroots movements are early signs of a re-ordering. All these factors seem quite fair to me to discuss and they all probably play key roles. But, as I’ve been writing about for a while, there is also talk about the end of radical free market ideology that became codified after Reagan and Greenspan were anointed gods among us. Greenspan has since admitted that there were errors in his analysis. A whole generation of Americans who grew up fearing Communism reacted against it by turning to corporatism in its extreme forms, in the process removing the key aspects behind successful democratic capitalism (accountability, sustainability, competition). What we have now in the US is hardly a democratic, capitalist system, what with protected trade, voter suppression, weakened individual rights, rampant oligopolies, and little oversight to nurture markets. Heller argues that the yearning for private property rights has led to dividing things up so much that they become underutilized. We know this to be true from egregious examples like the war for spectrum and intellectual property rights controversies and the duplication of music and movies for piracy. What I see above is where the future is going. The late 19th century and early 20th century gave rise to stateism, socialism, and communism. State command of the economy, top-down solutions. What came next was a move towards private control of resources, within the popularized desire for capitalism in the west. That may have reached its zenith now that such carved-up property rights have been found to be unsustainable for future growth, forming an “anti-commons”. Now authors like Heller and Lawrence Lessig are talking about the commons, allowing for what is essentially a way to democratize, incentivize, and innovate for individuals. Of course, you could shred this argument to threads but I think that what’s left for us to actively explore legally and socially is the move towards promoting more commons. That much seems fair to say. We’ve tried to prevent overuse of the commons, and we went too far. Now we will try to prevent underuse of the anti-commons. Some questions: where were we before all this? Monarchies, despots, highly top-down efforts? And before that? Small tribes exhibiting shared, collective, cooperative behavior, competing for resources against other tribes? How far have we actually come? Will we go too far in promoting a commons before finding a happy medium between state, private, and commons? Will the commons finally allow for many of the best hopes for democracy such as individual empowerment and self-actualization? What of Marx’s claims that capitalism gives way to socialism because capitalism is inherently unsustainable? Have we finally discovered all the core components towards a sustainable way of life, and now we just need to fine tune the balance?